What a moving poem. Thank you for this loving tribute. Thanks so much for sharing in it with me. I do so love those hands…. There’s something special about sharing them – and my grandma – with others that makes my heart sing. Krista, you are off to a fabulous start. Looking forward to reading more. How beautiful! The poem, your tribute, and those hands! Please keep writing! Welcome, welcome, welcome to the Slice of Life. Wow! I am already thinking about “borrowing” this format for a tribute to my mom . . .
What a wonderful slice. Can’t wait to read more of your writing! This line touched me: “all while waiting for the day her hands reunite with his.” Keep writing! Krista, Tears are in my eyes… I’ve been thinking a lot about hands recently and was particularly struck with the connection in your last line… “Then sings my soul…” For our hands are truly connected to our soul and the work of our hands is the work of our heart. Thank you for sharing. 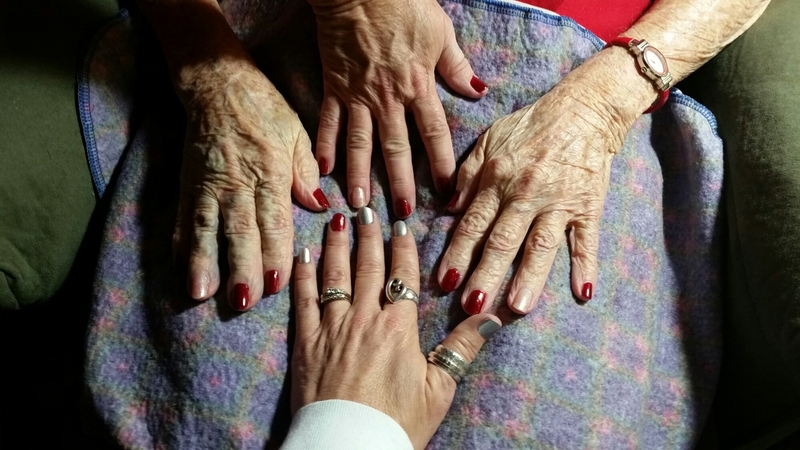 As I sat with my Grandma’s hands in mine last night, she asked why it was I was so taken by them…. That started the thinking that led to this poem – and oh! how it made my soul sing! You are off to a fabulous start, this was a beautiful tribute. I’m so proud of you for starting this new venture, and look forward to more! « Clothes Make the Man….? ?